ASICS has revealed a limited-edition rugby jersey to commemorate the centenary of the late Nelson Mandela’s birth. With only 500 available for rugby fans worldwide, the jersey will be worn by the Springbok Sevens Team – ‘Blitzbokke’ – at the upcoming Cape Town edition of the HSBC World Rugby Sevens Series on December 8-9 to honour South Africa’s revolutionary leader. Taking its green-and-gold inspired design from the intricately patterned shirts ‘Madiba’ was famous for wearing, the jersey graphic’s striking design also features the national flower of South Africa, the Protea, and a web of the nation’s flags surrounded by Springbok horns. The shirt’s inner-collar also features the iconic words of Nelson Mandela, “Sport has the power to change the world”, made at the Laureus Lifetime Achievement Awards Ceremony in 2000 when referring to the Springboks RWC victory in 1995. On the reverse of the collar is the Nelson Mandela Foundation logo. 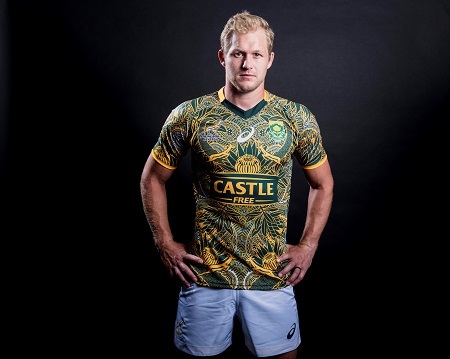 Made using the same hi-tech, lightweight, breathable fabric that helped the Springbok Sevens win the World Series in 2018, rugby fans in South-Africa and the UK will be able to purchase one of the 500 limited-edition jerseys. The Mandela Centenary Jersey retails for £110 and will be available in the UK from mid-December at ASICS.CO.UK, ASICS Regent Street flagship store in London and selected rugby retailers prodirectrugby.com, lovell-rugby.co.uk, fanatics.co.uk and thegaastore.com. To celebrate the shirt’s release and ASICS’ I MOVE ME campaign, ASICS will launch a series of five inspiring videos featuring South-African individuals and teams showcasing how sport has changed their lives. Among the stories are ‘The Maties’ Wheelchair Rugby Team, former South African international rugby player Chester Williams and players from the Springbok Sevens Team.